2016 Imagined Landscapes RWA Bristol (Feb 6th – June 12th) Co-curator and exhibiting artist. 2015 Awarded the RWA’s Derek Balmer PPRWA Painting Prize at the Annual Open Exhibition for the work Washington & Vicinity (Arlington betrayed). Showing of the film Transgression: rising waters https://vimeo.com/131955801 (Antony Lyons and Iain Biggs) and accompanying performance for the Royal Geographical Society conference, Exeter University. 2014 Awarded a Moore Institute Research Visiting Fellowship to work at the National University of Ireland, Galway. 2013 PLaCE /Parlour Show Rooms Walking in the City – an exhibition followed by a four day event co-curated by Mel Shearsmith and Iain Biggs as the September contribution to the In The City Series, July – December 2013. 2006-08 Contributing coordinator to Living in a material world: A cross-disciplinary location-based enquiry into the performativity of emptiness AHRC Landscape and Environment award. 2003 The Sowdun Project (1999-2005) – long-term English / Scottish borders deep mapping project. Research and publication relating to the early phase part-funded by an AHRC small grant. 2000 – 01 AHRB small research award. Co-ordinator and contributing artist for a major commission for Lloyds TSB at 125 Colmore Row, Birmingham producing design contributions to the workspace, seven paintings and nine prints. The necessary research into the paper-clay elements involved was part-funded by the AHRB. 1999 SWA grant – as member of In-House project with five artists in connection with Bath Fringe festival, part-funded by a SWA grant – I produced two installed works in private houses. 1985 Research Grant, Marsdon Foundation, New York. Landscape, Art and Uncertainty Southampton City Art Gallery. One of four members of LAND2 making work in response to images in the gallery’s collection. Closer to Home (4 works in group exhibition) East Street Arts, Leeds 11th – 30th July. 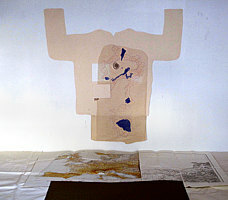 Two works in Poetry Beyond Text: Vision, Text + Cognition at the the Royal Scottish Academy 12.11.2011 – 18.12. 2011. Image from the LAND2 Bridges folio – (Iain Biggs ed. 2003, designed by iSophia, Bristol, Wild Conversations Press for LAND2) & 8 Lost Songs (Iain Biggs 2005, Bristol, Wild Conversations Press). 5 book works in The Art of the Book: Journals Then and Now, an international travelling exhibition of artist book journals, diaries and letters – shown at: Gallery 210, University of Missouri-St. Louis, USA (11/02/10 – 08/05/10) Bower Ashton Library, UWE Bristol, (21/7/10-27/810) and Winchester School of Art (04/10/2010 – 12/11/ 2010), see http://www.bookarts.uwe.ac.uk/artofbook10.htm. On Mull (with Josh Biggs) Bristol: Wild Conversations Press for TRACE in conjunction with the LAND2 group exhibition Fieldwork, An Tobar Arts Centre, Tobermory, Isle of Mull (3rd March – 18th April, 2009) & Galleri VOX, Bergen, exhibition Å reise en utstilling med bokkunst fra England og norge (1st -25th October 2009). Four drawings in All Over the Place (F Block Gallery, FCA, UWE, Bristol 7th -21st November). Exhibition organized jointly by LAND2 and the Drawing Group Centre for Art Media, University of Lincoln. Work in LAN2D – beyond landscape? Royal West of England Academy, Bristol (3 works) June 25th – July 23rd, 2005. Curated by Judith Tucker and Iain Biggs (also at Dean Clough Nov. 6 2004 – Jan 8 2005). Two prints included in TRACE editions, Hirschl Gallery, London May 22nd – 29th. Three artist’s books included in Houseroom exhibition May 15th – June 26th. Bath. Book works exhibited at the 7th International Contemporary Artist’s Book Fair, Dean Clough Galleries, Halifax on Sat 13th March. 6 works selected for reading, writing & ‘rithmetic curated by Sian Bonnell for TRACE, Sherborne House, 24th Jan – 8th Feb.
2 works selected for On the Edge: Ninth Biennial International Juried Touring Exhibition (sponsored by the Enamelist Society, USA). August – October, 2003. The Evergreen State College, Olympia, Washington; Gallery Mack, Seattle, Washington; The Centre for Contemporary Crafts Gallery, Portland, Oregon. Royal West of England 151st Autumn Exhibition, 26th Oct. – 13th Dec. One work. ‘Tam Lin Variations: Paired Enamels and Paintings, Studio Fusion, London. Invited artist. (18 works) Jan. 10th. – Feb. 10th. ‘Lavington Street’ prints. (Set of six, each in addition of six). Part of a major commission for renovation of a building in Lavington St., London SE1 for Lloyds TSB. Installation of major commission for Lloyds TSB at 125 Colmore Row,Birmingham. Project co-ordinator and contributing artist. (Seven paintings and nine prints). Contemporary Print in Enamel, School of Art Gallery, Kent State University Feb. 26th. – Mar 12th. (3 works in mixed show + catalogue essay pp. 10-11 & illustrations: 2 colour, 1 b&w). Touring to East Carolina University and Cleveland Institute of Arts. (Dates to be confirmed). Two drawings in Artists from the University of the West of England, The British Council, S Widjojo Center, Jakarta. One print included in the exhibition World Etching at the Chongqing Prints Festival (and touring), China 2000. 5th. Open Print Exhibition Royal West of England Academy 26th Mar. – 6th May. Co-editor FOLD (with Jane Millar and Andrea Duncan) and contributing artist. Issue one, Feb. 2000. London, FOLD Group ISSN 1466-4089, 20 pages. Launched at the Freud Museum, London Feb. 17th, 2000. FOLD evening at 291 Gallery, London 27th April 2000. In House Twice: two part installation with 5 artists for Bath Fringe Festival 29th May-13 June (with funding from SWA). Contemporary Print in Enamel Studio Fusion, London, May & Impact Conference, Bristol, September. Bedminster Memory Map, installation for Lloyds TSB, Bristol. 10th Annual Miniprint Show (Touring Exhibition, mixed, 1 work) Parsons Gallery, Parsons School of Art, New York, USA; Carbondale School of Art, Illinois, USA: Vergette Gallery, Chicago , USA. Miniprint 1997 (group show, 1 work) Touring exhibition: Ohio State University, USA; Rhodes University, South Africa; University of Southern Illinois, USA; AKI Enschede, Holland. Millfield Open (Open and invited exhibition, 1 work, Atkinson Gallery, Millfield, Street. 3 weeks June’95. Major prize winner Millfield Open (open and invited national competition) Atkinson Gallery, Street (June).